we'd like to take a moment to recognize the dedication of a proud Marine mother and long-time volunteer and supporter of our organization—Angie Regan. Angie is a volunteer from Columbia, Missouri who found Marine Parents shortly after her son shipped to boot camp at MCRD San Diego in December, 2011 while trying to learn what to expect during his time in the Corps. As Angie learned more about our organization, she became involved in our Care Pacakge Project™ pack days, and shortly thereafter began her mission of supporting wounded, ill, and injured troops by writing cards and letters for our Operation: Prayers and Letters™ program. In mid-2012 there was an opening for a new manager of Operation: Prayers and Letters™ and Angie stepped up and offered to take on the responsibilities of what can be a very time-consuming, detail-oriented position. Between when Angie took over as manager of Operation: Prayers and Letters™ in 2012 and the program's closure in October of 2015, approximately 25,000 cards and letters were sent to wounded, ill, and injured service members. The service members and their families often commented on what a difference receiving these cards and letters made in their recovery. 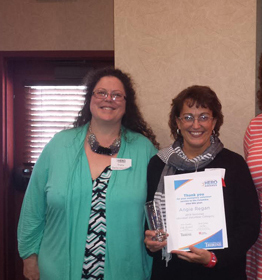 Angie Regan (right) standing with MarineParents.com's Founder & Executive Director Tracy Della Vecchia (left) after Regan was awarded her "Volunteer of the Year" award in 2014. In addition to serving as Manager of Operation: Prayers and Letters™, Angie was recognized by Marine Parents as one of our 2014 "Volunteers of the Year" for her unwavering dedication to, and support of, our organization. We'd like to offer a heartfelt "thank you" to Angie and all of our other amazing volunteers around the country. None of what we do as an organization would be possible without your unwavering support of our men and women in uniform. Your efforts on our behalf are truly appreciated.